Why choose Bond for your custom wheel? You will receive over one hundred years of wheel and caster knowledge in the wheel offering that is correctly matched to your application. Having a problem with wear, bearing failure, greasing, static electricity, axle failure, floor damage, etc.? Bond can help you find a solution. Taking a standard wheel and changing the hub length, face width, diameter, inside bore (plain bore) and tread shape are common machined changes made to custom fit your wheel to the legs/fork already in use. 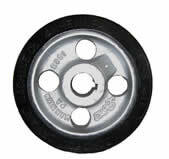 A drive wheel may be fixed with a set screw(s), keyway or with both a keyway(s) and set screw(s). Keyways and set screws are often sized or specified by the diameter of the shaft but can be custom produced. Matching idler wheels are also available. 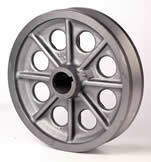 Specific wheels sized and shaped for angle iron or round tracks are custom and our specialty. Bond manufacturers standard and custom V-groove and "U" groove, single flanged and double flanged wheel out of various materials. There are several considerations for these wheels that will allow a long service life. Please consult the factory. Replicating a caster and wheel that is no longer made. 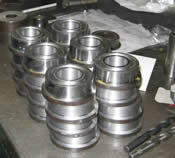 Bond has provided many solutions to casters and wheels that are no longer available. In consideration we will also offer the current and best solution supporting the application and life of the product.